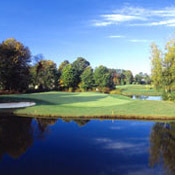 Knob Hill, New Jersey's premiere golf club, offers its members an exceptional club experience. From the immaculate and challenging Mark McCumber designed course, to our spectacular clubhouse, Knob Hill is the one club you've been waiting for. We invite you to tour our web site, learn about Knob Hill Golf Club membership options, and visit us to discover just how unique and special a club we have created. There are only a limited number of memberships still available, so we encourage you to act quickly. Knob Hill is also the place where your entertaining dreams come true! Whether you are planning a wedding, birthday party, banquet, business meeting or corporate event, you can count on Knob Hill to work with you to create a fabulous affair.